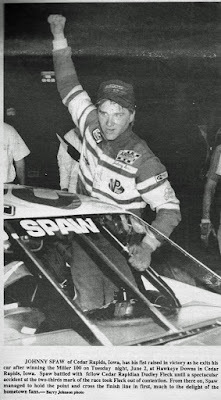 Cedar Rapids, Iowa (June 2, 1992) – Cedar Rapids, Iowa, veteran Johnny Spaw picked up his first Miller Genuine Draft 100 victory on Tuesday, taking the lead on lap 71 when Dudley Fleck, another Cedar Rapids veteran, was knocked out of the race in a spectacular straightaway crash. 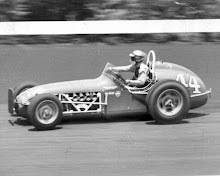 Fleck had driven a strong race, leading the first 71 circuits. 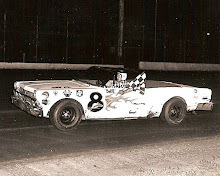 But as the field came out of turn four, a lap car slowed suddenly and Fleck couldn’t avoid him. Fleck went over the top of the car, sailing high in the air and rolling before the car caught on fire briefly. There were no serious injuries in the mishap. 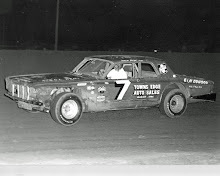 Spaw, who had been pushing Fleck hard just before the crash, inherited the lead and went on to victory ahead of Dwain Behrens, Ted Smokestad and Kevin Nuttleman. The 20th annual race for charity drew a crowd estimated at 4,500 and the weather was ideal. Spaw also set fast time during qualifications, turning a lap on the paved half-mile in 20.733 seconds. 2. Dwain Behrens, Lakeville, Minn.
3. 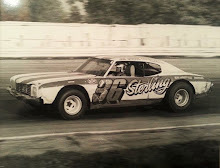 Ted Smokestad, Lakeville, Minn.
4. Kevin Nuttleman, Bangor, Wis.
5. 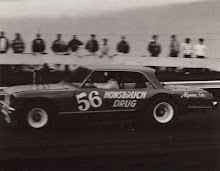 Ricky Bilderback, Rockford, Ill.
6. Steve Carlson, West Salem, Wis.
7. Shawn Pfaff, Sparta, Wis.
9. Steve Murgic, Rosemount, Minn.